Gerry Anderson is a producer with a difference, for he has been responsible for bringing to our screens unique and exciting shows like “Supercar”, “Fireball XL5”, “Stingray” and, the most exciting of all, “Thunderbirds”. His leading characters are puppets, but so realistic are they that names like Mike Mercury, Steve Zodiac, Troy Tempest, Jeff Tracy and his sons, Scott, Virgil, Alan, Gordon and John, together with Lady Penelope, have become as famous as those of many human stars. Anderson produces his spectacular shows on the lines of a full-length feature production, and the result is slick, polished entertainment. He and his wife, Sylvia, have brought stature to the TV puppet on a scale difficult to believe possible. Their films enjoy a tremendous popularity, not only on our screen but also in America. His recent “Thunderbirds” was sold to America for over a million pounds. In a film studio in Slough, formerly a disused factory and now a well-equipped studios, the Anderson puppet characters come to life. They play their parts on a miniature set in which the scenery is generally no higher than four feet. Everything is about one-third of normal size, which of course necessitates the making of almost everything that appears on the set—furniture and fittings, jewellery, crockery, guns, lamps, and so on. 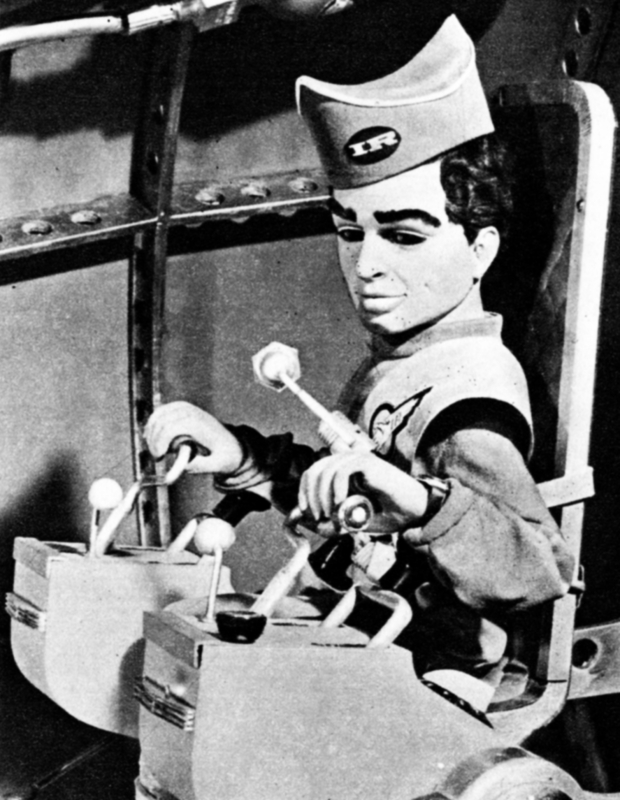 Each episode of “Thunderbirds”, which runs for an hour on screen, takes about one month to film. The problems are of course numerous, and sometimes far more intricate than those which face makers of feature films. As Gerry Anderson says, to produce science-fiction for television is just about the most gruelling thing he can think of. But he is a man with plenty of patience, and the rewards he has reaped have proved well worth the effort. His company, A.P. 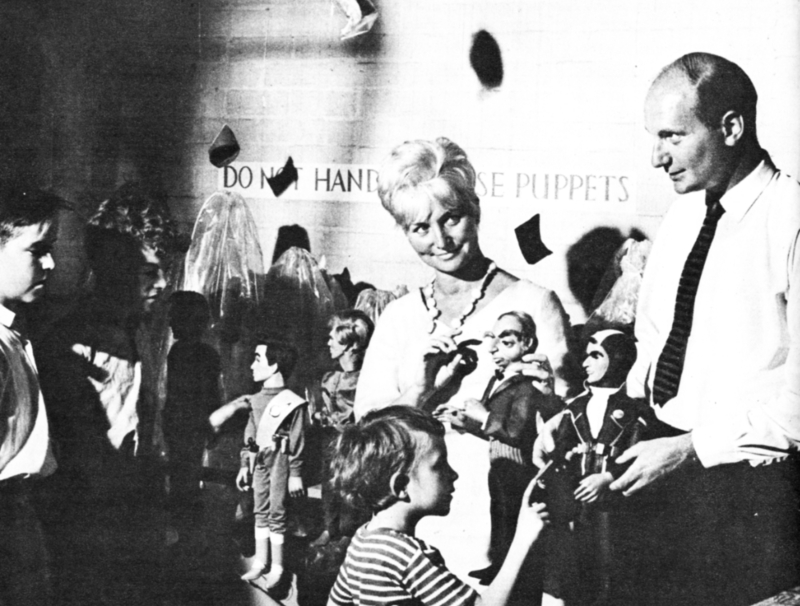 Films Ltd., started in 1958 with the production of puppet pictures in an old mansion near the River Thames at Maidenhead. Four people were concerned: Gerry Anderson, Reg Hill, John Read (the lighting cameraman), and a fair-haired Londoner who has since become Mrs. Gerry Anderson. 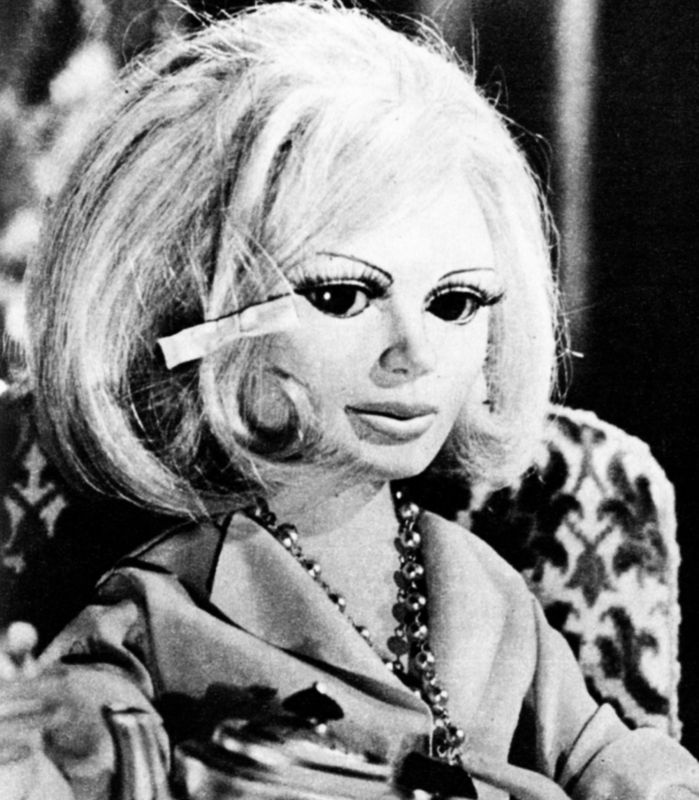 Sylvia Anderson also speaks many of the parts and is the voice of Lady Penelope in “Thunderbirds”. 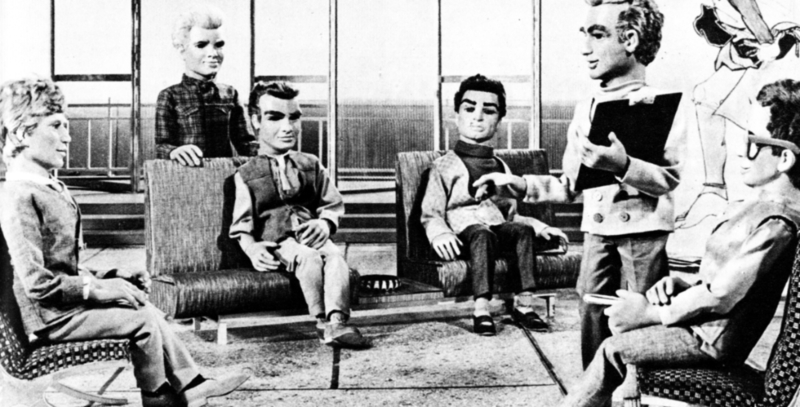 The Tracy family of “Thunderbirds” (left to right): Gordon, Alan, Virgil, Scott, Jeff and Brains. But where is John? From their modest beginnings, the company has become a massive organisation. Their phenomenal success story is the result of imagination, gruelling hard work, and determination to succeed. They started with £500, but today they are worth millions.